In August of 1983 Shana Alexander, acclaimed journalist and chronicler of the lives and criminal trials of Jean Harris and Patty Hearst, wrote to New York City ballet patron Frances Schreuder on the eve of her murder trial. Schreuder stood accused of unlawfully causing the death of her father, Franklin Bradshaw, and of soliciting, encouraging, and aiding her prep school–student son in the homicide in the hope of financial gain. Alexander never received a response, but she flew to Salt Lake City and met with Schreuder’s mother, the matriarch of the Mormon dynasty—eighty-year-old Berenice Bradshaw. Nutcracker is the true story of this crime—the twisting four-year police investigation, the derailed cover-up and conspiracy, the dramatic trials. It is also the tale of a family riven by greed and madness. Drawing on interviews with all the major players, Alexander paints a powerful portrait of a psychopathic woman driven by avarice, so depraved that she persuaded her own son to commit grand-patricide. 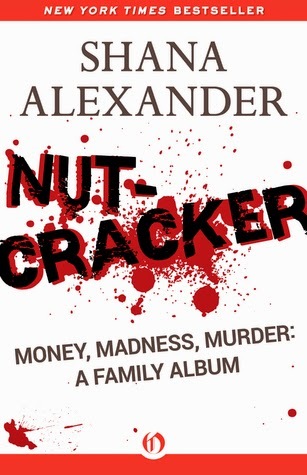 Nutcracker was a finalist for the Edgar Award for Best Fact Crime of 1986. The Nutcracker by Shana Alexander is a 2015 Open Road Media publication. I was provided a copy of this book by the publisher and Netgalley in exchange for an honest review. This is the true crime story of the murder of Franklin Bradshaw whose youngest daughter, Frances plotted and planned his murder and coerced her son, Marc to do the deed. While this case spawned numerous accounts of the crime, which primarily focused on the investigation and trial, none of the books, or TV movies delved as deeply into the family's psyche as this one. Originally published in the mid 1980's Open Road Integrated Media has re-issued the book in digital format. So much time has passed since the crime occurred, I had forgotten many of the details. Revisiting it now, I found myself once more riveted by this incredible case and it is as shocking now as it was then. What kind of person commits patricide? What kind of person lures their own child to kill his grandfather? That is the question that haunts many of us, so a good hard look at the inner workings of Frances' upbringing, her parents background, and the general dynamic of the Bradshaw family might shed a little light on the subject. Certainly it does raise some interesting questions. Mental illness, Franklin's demeanor and Berenice's issues, against the Utah scenery and the Mormon faith made an interesting atmosphere for the Bradshaw children to grow up in. Franklin was a cold man who worked more than he slept, rarely spent time at home, leaving Berenice to raise four children alone, was frugal to a fault, and was not too sensitive to his wife's mental illness, shrugging it off as having a nervous personality. Naturally there was a will, one Frances was afraid she could be written out of, thus disrupting her lavish lifestyle. As the story progresses, we get a chilling in depth look at the diabolical and cold blooded mother and son team of Frances and Marc. Certainly Berenice is also an enigma as she continues to disbelief her daughter capable of such a thing and she watches helplessly as her entire family crumbles around her. This family was mired in mental illness that went back several generations, but was never diagnosed or treated. One does have to wonder if Franklin had not had such a disdain for doctors, if he had not dismissed Berenice's symptoms, if perhaps they had seen the signs of mental instability in Frances, that maybe there was a chance none of these things would have happened. However, I am not totally convinced of that. I believed wholeheartedly that Berenice suffered from a form of mental illness, I also believe Frances was mentally unstable, however, this crime and all the others that went with it, such as Frances and Marc stealing family jewelry and Marc's lack of pride or ambition, refusing to work for his money like his grandfather did, leads me believe this murder was committed in cold blood with greed and money as the motive.